Home > Articles > Am I Ugly? Moms, Lets Counter the Trend of Our Girls Feeling Inferior! As a mom of an almost-12-year-old daughter – and a social researcher who has extensively interviewed and surveyed teenagers – my heart is hurting as I see the newest YouTube trend. There’s been a spate of articles in recent weeks about thousands of young girls who, desperate to feel loved and accepted, are posting videos of themselves asking the question, “Am I ugly?” How painful to see our daughters feeling so insecure and desperate for approval that they would go to these lengths to try to feel better about themselves. It is especially painful because many of us grown-up-women are still those little girls inside. And if we feel echoes of those doubts (Am I special? Am I beautiful? Am I loveable?) how much more do our daughters? According to my survey of teenage girls (for my book For Young Men Only, to help guys understand how young women think) 91% of girls — even the most beautiful, kind, well-liked girls! — are insecure about whether they are pretty and special and loveable. It is that insecurity that becomes a sense of inferiority, that leads some of these precious girls to put themselves on camera in front of an international audience and base how they feel about themselves on the comments they get from complete strangers. I can’t figure out what is worse – that teen girls do this, or that people respond. Moms, we can do our part to stop this trend. We have to help our daughters realize that we all have those questions – yes, a 40-year-old-mom wants to feel pretty and thin too! — but the real question is what do we about it. It is so easy to look to the attention of friends, or the affection of guys to feel good about ourselves. It is tempting to look to that bowl of ice cream for comfort – or to the control that comes from throwing away our lunch at school to try to get skinny. It is seductive to rely on that ‘new and improved’ feeling that comes when you get a cute new outfit that makes you feel like you fit in at school. But you know what? We need to help our girls realize that looking to those things to make you feel better will actually make you feel worse – because all those things are temporary, and tomorrow you’re going to wake up with the same old insecurities and doubts. We need to help our daughters realize that what they are looking for and craving, only God can provide. Only God can provide that affirmation, that sense of self-worth: He is the one who created you, so only He has the ability to call you beautiful, special and lovable – and have it be so! Looking to anything other than Him for happiness and satisfaction will backfire and make you feel worse in the end. One reason I was so impacted by the YouTube trend is that I’ve been working on a book on this exact subject, that is releasing this week. Last year, I was deeply impacted by Lysa TerKeurst’s New York Times bestselling book Made to Crave, which encourages us to crave God, not the satisfaction that comes from food. So I was honored when Lysa asked me to partner with her in co-authoring Made to Crave for Young Women. We went far beyond the food issue to discuss all those things that girls sometimes look to for affirmation – and show our beautiful teen and pre-teen readers how they and every other girl can be satisfied with God alone. My daughter is asking all the same questions as every other girl I’ve interviewed and surveyed. I know she will be tempted like every other girl to gauge her beauty and worth on her popularity, and the opinions of a boy she likes. I don’t want her turning to those things, or to the latest trend in clothes, shopping, popularity or eating disorders to fill a void in her heart. Moms, I’m sure the one thing you and I have in common is that we are trying to teach our daughters what it means to find their value in God, and God alone. I hope the new book gives you a tool to counter that sense of inferiority with great encouragement and inspiration for the beautiful young woman in your life. Moms, where do you see your daughter looking for the answers to the questions, am I beautiful, special and lovable? What can you do as a mom to point your daughters to the only One who can truly fulfill her? 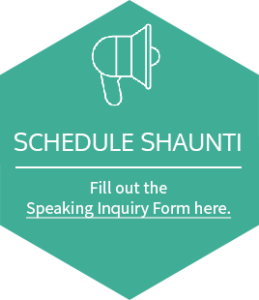 Prior to becoming an author, Shaunti Feldhahn worked in the financial arena on Capitol Hill and later on Wall Street, analyzing the Japanese financial crisis for the highest level decision makers of the Federal Reserve System. She now applies that same skill set to investigating eye-opening truths that many of us tend to miss.